A pup or dog who has not finished housetraining should never be allowed the run of the house unattended. A new dog (especially a puppy) with unlimited access to your house will make her own choices about where to eliminate. Vigilance during your new dog's first few weeks in your home will pay big dividends. Every potty mistake delays housetraining progress; every success speeds it along. The way you structure your pup's corral area is very important. Her bed, food, and water should be at the opposite end of the corral from the potty area. When you first get your pup, spread newspaper over the rest of the floor of her playpen corral. Lay the papers at least four pages thick and be sure to overlap the edges. As you note the pup's progress, you can remove the papers nearest the sleeping and eating corner. Gradually decrease the size of the papered area until only the end where you want the pup to eliminate is covered. If you will be training your dog to eliminate outside, place newspaper at the end of the corral that is closest to the door that leads outdoors. That way as she moves away from the clean area to the papered area, the pup will also form the habit of heading toward the door to go out. Maintain a scent marker for the pup's potty area by reserving a small soiled piece of paper when you clean up. Place this piece, with her scent of urine, under the top sheet of the clean papers you spread. This will cue your pup where to eliminate. Most dog owners use a combination of indoor papers and outdoor elimination areas. When the pup is left by herself in the corral, she can potty on the ever-present newspaper. When you are available to take the pup outside, she can do her business in the outdoor spot. It is not difficult to switch a pup from indoor paper training to outdoor elimination. Owners of large pups often switch early, but potty papers are still useful if the pup spends time in her indoor corral while you're away. Use the papers as long as your pup needs them. If you come home and they haven't been soiled, you are ahead. When setting up your pup's outdoor yard, put the lounging area as far away as possible from the potty area, just as with the indoor corral setup. People with large yards, for example, might leave a patch unmowed at the edge of the lawn to serve as the dog's elimination area. 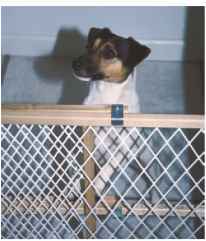 Other dog owners teach the dog to relieve herself in a designated corner of a deck or patio. For an apartment-dwelling city dog, the outdoor potty area might be a tiny balcony or the curb. Each dog owner has somewhat different expectations for their dog. Teach your dog to eliminate in a spot that suits your environment and lifestyle. Be sure to pick up droppings in your yard at least once a day. Dogs have a natural desire to stay far away from their own excrement, and if too many piles litter the ground, your dog won't want to walk through it and will start eliminating elsewhere. Leave just one small piece of feces in the potty area to remind your dog where the right spot is located. A dog who is not reliably housetrained should never have free run of the house. 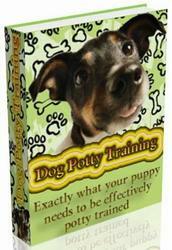 A young puppy will need very frequent potty trips. When you take the dog outdoors to her spot, keep her leashed so that she won't wander away. Stand quietly and let her sniff around in the designated area. 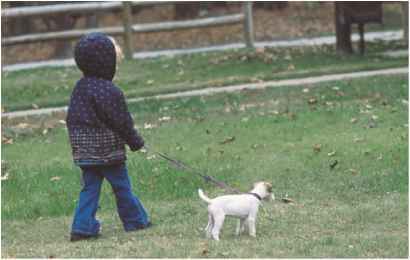 If your pup starts to leave before she has eliminated, gently lead her back and remind her to go. If your pup sniffs at the spot, praise her calmly, say the command word, and just wait. If she produces, praise serenely, then give her time to sniff around a little more. She may not be finished, so give her time to go again before allowing her to play and explore her new home. If you find yourself waiting more than five minutes for your dog to potty, take her back inside. Watch your pup carefully for twenty minutes, not giving her any opportunity to slip away to eliminate unnoticed. If you are too busy to watch the pup, put her in her crate. After twenty minutes, take her to the outdoor potty spot again and tell her what to do. If you're unsuccessful after five minutes, crate the dog again. Give her another chance to eliminate in fifteen or twenty minutes. Eventually, she will have to go.